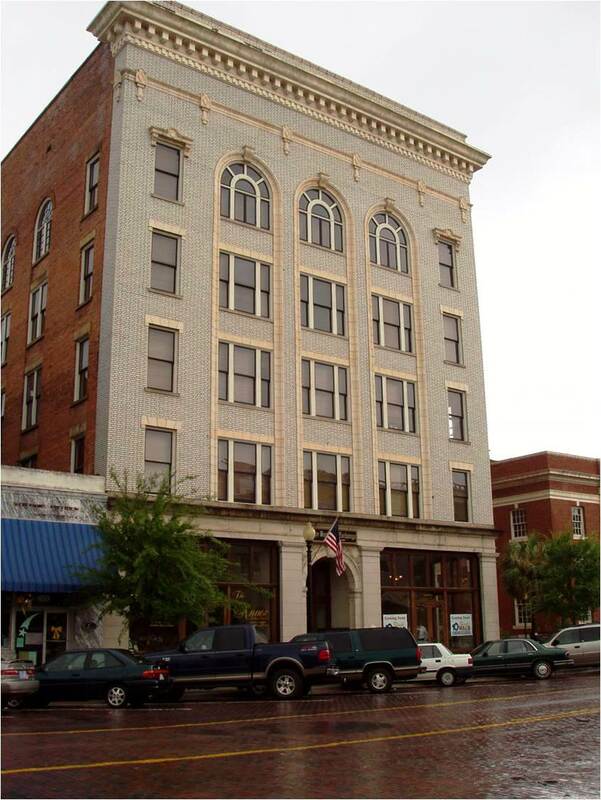 The façade of this five story building in Thomasville, Georgia's Commercial Historic District has been rehabilitated to preserve the building's historic character. Thomasville (population 18,162), county seat of Thomas County, was founded in 1826. Before the Civil War, cotton cultivation and other agricultural enterprises were the foundation of the economy. While the war itself had relatively little physical impact on the community, the coming of the railroad in 1861 led to the town’s transformation in the late 19th century. As the southernmost stop on the railroad, Thomasville evolved into a winter resort for wealthy northerners. While the “grand hotel era” ended with the extension of the railroad into Florida, many of the elaborate winter homes constructed during that period continue to grace the community. Thomasville has seven historic districts representing nearly all of the architectural styles popular during the 19th and early 20th centuries. In its historic commercial area, the Thomasville Main Street Program has helped to catalyze over $44 million in reinvestment since 1982. A walking-driving tour is available to encourage visitors to view the community’s historic resources. There also is a guide focused on sites associated with Thomasville’s African-American heritage, such as the grave of Thomasville native Lt. Henry Ossian Flipper, the first African-American to graduate from the United States Military Academy-West Point. Tourists and visitors alike have opportunities to enjoy the community’s historic resources during the annual Rose Festival, which has been held since 1921. It is the oldest continuous rose show in the southeast, and one of the oldest in the nation.